IMPORTANT NOTE: If you still use version 1.0 DO NOT uninstall it during plugin update! All quizzes will disappear. Update directions: Overwrite plugin folder via FTP. Then deactivate and activate plugin again. But do not uninstall it! This issue has already been fixed in v1.1. So everything will be fine with next updates. You can download the latest version of plugin on CodeCanyon. Don’t forget to sign in Envato account that was used for purchase. Deactivate the plugin from within your WordPress dashboard, in the Plugins section. Once you have your plugin deactivated, uninstall it completely. You can uninstall the plugin from within your WordPress dashboard, in the Plugins section. Login to your WordPress account, and navigate to the Plugins section on the left sidebar of your dashboard. Select Add New. You will have the option to upload a plugin manually. Locate and select onionbuzz.zip. Once this is completed, activate the plugin. You might wish to use FTP instead of uninstalling and reinstalling. 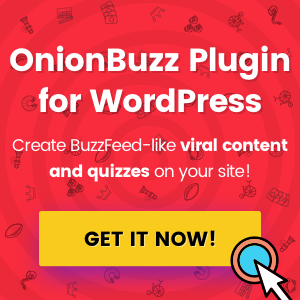 Unpack the plugin ZIP file, which will give you the onionbuzz folder. Upload the new contents of this folder into the already existing folder located in …/wp-content/plugins/ directory.